Though I’m going to talk about two pies here (because there was leftover crust from the first one), the cherry one was most interesting to me because I wasn’t sure at first how to flavor the filling. I also had to invest in a cherry pitter, which falls under the category of uni-tasker. The pitter was very helpful with prepping the cherries. But instead of following their recipe completely, I also looked up a bourbon cherries recipe in case I had cherries leftover. You can find many of these recipes if you Google them. I even picked out a fancy bourbon (Buffalo Trace) to cook this filling like you are preparing a jam. 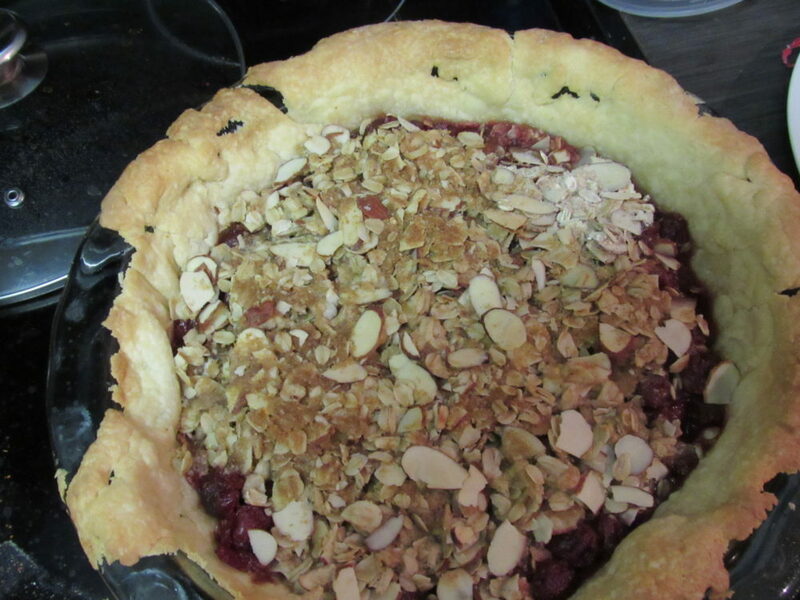 The first pie (shown above) turned out great for our summer seafood boil. The crust kind of broke, but the cherry filling truly converted me to making cherry pies for next summer: the tender, juicy cherries soaked very well with the caramely bourbon and zesty orange. With the leftover pie crust, I made a chocolate pecan pie because I had a lot of pecans on hand. I’ve made pecan pie before, but borrowed a recipe from the internet (can’t remember which one). The pie filling recipe for this pie was not as successful. I was suspicious that the recipe said to use flour to thicken, but I followed the directions. The filling becomes clumpy and thick to stick the chocolate to the nuts, but it was not the gel-like texture I think of for pecan pie. The pie was not inedible (and was used for breakfast and freezing) but I want to perfect this pie in the fall or winter season.